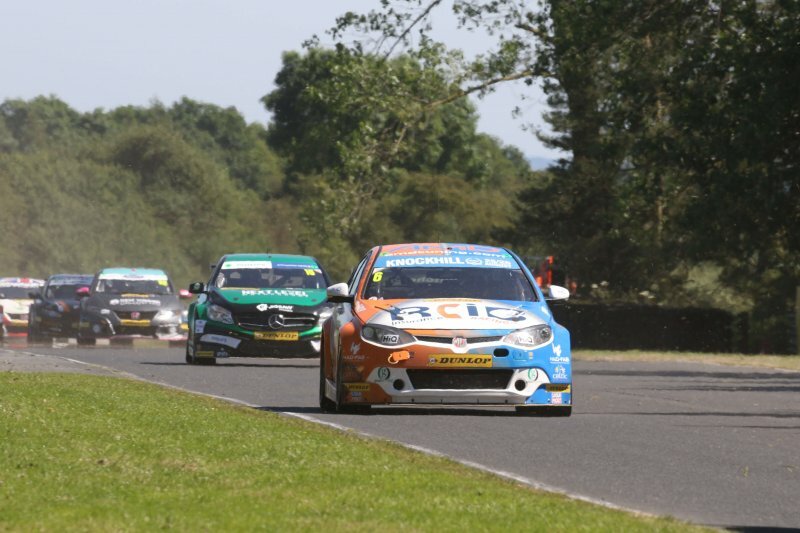 The AmD with AutoAid/RCIB Insurance Racing team secured three more points finishes as the Dunlop MSA British Touring Car Championship season hit the half way stage at Croft. The West Thurrock-based team made the long journey north hoping to challenge inside the top 15 with the pair of MG6 GTs it is campaigning for the first time this year. Having shown strong pace through free practice, Fife-racer Rory Butcher qualified in 13th place on the grid for the opening race with a best time just eight tenths of a second away from pole position. Despite running the less favourable hard tyre, Rory was able to take 13th in the opening race having come out on top of a late battle with fellow AmD racer Ollie Jackson’s Audi S3. Maintaining his position at the start of race two, Rory then about working his way through the pack and he would match the pace of the leading pack en-route to tenth place – just missing out on pole position for race three when the reverse grid draw took place. A 13th place finish in the final race of the weekend means Rory heads into the summer break sitting 19th in the overall standings and tenth in the Independents’ Trophy. Rory now also holds second place in the Jack Sears Trophy for drivers who haven’t finished on the overall podium. Forton-based team-mate Tom Boardman was left with work to do on race day having qualified in 31st spot, with a handling issue on his car preventing him from securing a place higher up the grid. Having finished the opening race in 26th place, Tom was making good progress up the order in race two to sit on the fringes of the top 20 when a stone thrown up by a car ahead pierced the radiator on his car and forced him back into the pits to retire. Starting at the back for race three as a result, Tom fought his way through to 23rd place at the finish, with the positions gained across the weekend seeing him move to the head of Dunlop’s #ForeverForward standings – which is based on how many places a driver can make up across the season. Tom sits 27th in the overall standings and 18th amongst the Independents’ at the half way stage of the season. “It’s been a good weekend to take us into the summer break. We took a step forward in qualifying and then end result was that is allowed us to challenge for points in all three races; it certainly made life a bit easier. “It was a difficult start to race day with the hard tyre but we did what we could with it and the second race it was really good to break into the top ten. Whilst we then struggled with the tyres a bit for some reason in race three, we picked up more points on the board. “It was a very difficult weekend for me after qualifying when we didn’t have the set-up quite right on the car, and it meant I was on the back foot going into the races. “It was always going to be tough from the back but I was focused on the #ForeverForward standings and trying to make up as many places as I could. It was all going well until the second race when a stone got thrown through the radiator which was a shame as we were getting closer the points, and I felt we could have scored before the end of the day. “It’s good that we have reached the summer break with some more points finishes for the MGs, and Rory has done a good job this weekend. It shows that qualifying is so important in this series as a good performance there set him up well for race day and he made the most of it. “Tom was unlucky because of what happened in the second race when he was pushing forwards through the pack and I think there was the potential for him to also score some points. The fact he tops the #ForeverForward standings shows what he can do in the races but we need to find more from qualifying. Photo again by the very talented Mr Marc Waller.